After the Parthenon, they are probably the second most photographed sight in Athens; every day visitors from around the world stand before them posing for selfies, admiring their fine features and wondering aloud about their “dresses”. The weather changes from sunshine to rain and back to sunshine again, crowds of pedestrians hurry by like caffeinated ants, while on the roads drivers honk and curse. The odd demonstration passes by from time to time, blaring slogans and beating drums. Through it all, even as Greece’s biggest city bustles frenetically around them, statues remain motionless at its heart, standing in front of the Parliament in Syntagma Square, their faces ever solemn, their eyes gazing at some unseen horizon. But these statues are unlike those of the Parthenon or Acropolis Museum; they are the Evzones – the living, breathing soldiers of the Presidential Guard whose duty it is to stand guard at the Tomb of Unknown Soldier 24/7, 365 days a year. While ever-present at their posts, to most visitors they remain enigmatic. Who are these young men, and why do they take on the arduous role of becoming living symbols of the Greek state? What few people realize is that the Evzones are all conscripts, young men of the infantry fulfilling their National Service obligations. They get paid the same as all conscripts throughout the armed forces: about 8 euros a month. Photographer Dimitra Hatziadam spent three years capturing the young men who take on the role of embodying the nation’s ideals. Her resulting exhibition “Evzones” has toured all around Greece and been visited by luminaries including the President of the Hellenic Republic. We sat down with the photographer recently to speak to her about her project and what she learned about the world of the Evzones. How did your project of photographing the Evzones come about? I was working as a photographer covering official functions of the President of the Republic, such as visits by foreign heads of state and ambassadors, so there was visual contact [with the Evzones] for about three years. Then, after a separate project photographing a bishop putting on his ceremonial vestments, the idea was born of photographing how the Evzones get dressed. And that was the beginning of a long journey, on which I didn’t know what I would encounter – whether I would be able to complete it photographically, and that’s why it took over three years. The relationship was built very slowly, very cautiously – both on my part and theirs. And then they opened their arms, they began to see me as “one of ours”, and so they began sharing aspects of their experience. And that was the beginning of a magical journey, one where I discovered what it is to photograph a Greek symbol and to have the luxury of knowing them by their first names, when others see them as symbols – unspeaking, motionless, as they should be. How hard is it to be an Evzone? Of the conscripts that are selected, up to 50% don’t make it through the training, either because they can’t handle it psychologically, or physically. Some may not be able to handle remaining motionless, others may have old injuries that give them trouble. Although its the mental aspect that is probably the hardest, to achieve something that is so difficult. Especially given that there is no financial reward. The training begins with remaining totally motionless at first for 5 minutes, and that reaches 2-3 hours, gradually, step by step. And that regardless of the weather conditions – be it summer or winter – because that’s what the role requires. What are the criteria for a conscript to be selected to be part of the Presidential Guard? He needs to be tall – the minimum height requirement is 1.87m. He needs to be Christian Orthodox. He needs to be healthy physically and mentally, and to have goals, in order to be able to harness his mind when he is on duty, so that he is not affected by anything. They are so trained such that nothing will trouble them when they are on duty. During the official changing of the guard ceremony on Sunday. 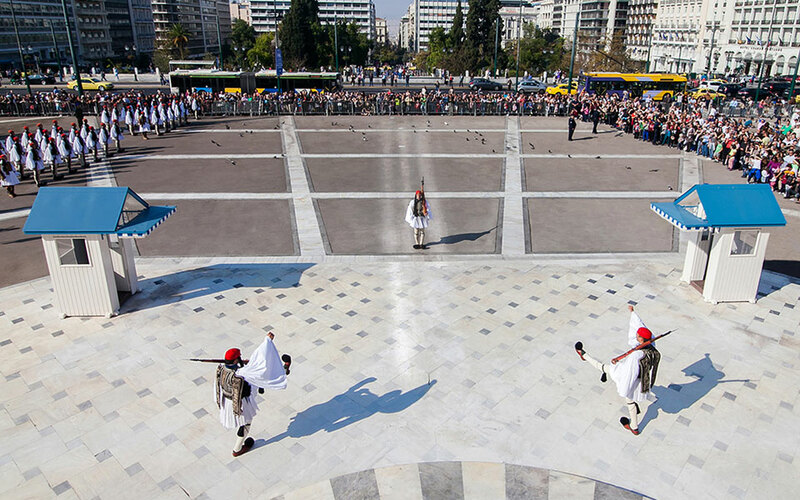 The faint lines in the middle of the square have been created by the marching of the Evzones over the years. What is a typical day like for an Evzone? They wake up early every day, at about 6.00am. They have breakfast and then after breakfast have mandatory exercise for two hours. And then they start their shifts which they have every four hours. So during the day there is a routine of getting dressed, doing a shift, getting undressed, resting for a bit, then going for another shift – they don’t just do one hour-long duty each day. They stand guard for a number of hours every day – either at the Tomb of the Unknown Soldier or at the Presidential Mansion – and often in the middle of the night. And then on Sunday – as they themselves say, Sunday is the day of celebration for the Evzona. It begins at 6.00am when they need to get up and get dressed to head up for the raising of the flag at the Acropolis, which happens at 8.00am. That is not open to the public, the public can see them on their way down, at about 8.10. And then at 10.30 they head out for the official changing of the guard at the Tomb of the Unknown Soldier at 11.00. How is the changing of the guard on Sundays different to what happens every day? The difference is that at the Tomb of the Unknown Soldier every hour the two sentries there are relieved by another two. That happens every hour of every day and night throughout the year. It never stops regardless of the conditions. 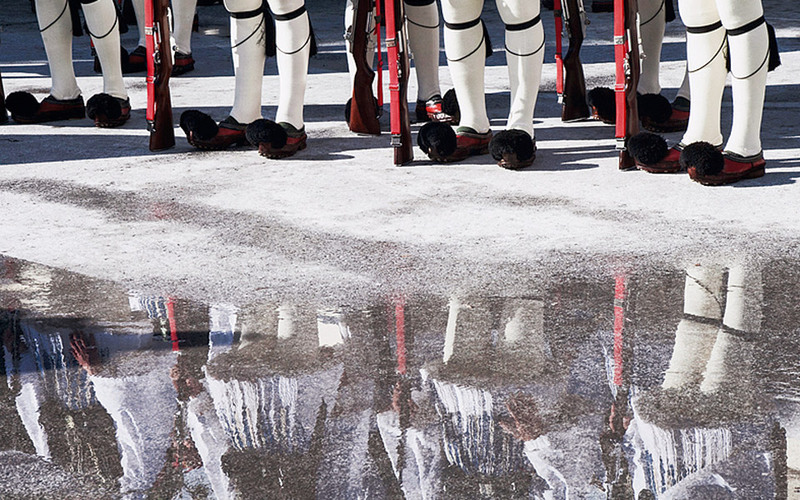 The difference on Sunday for the official changing of the guard is that the entire Presidential Guard comes out and there is an official changing of the two existing sentries with two new Evzones. And that is always accompanied with a marching band. Evzones always function as pairs. The process of dressing takes about an hour. And what did you learn from following them so closely and getting to know them, that others may not realize? The most magic thing is that the Evzones are a family. They constantly want to do duties – with different uniforms, and up at the Acropolis to be the one to raise the flag. 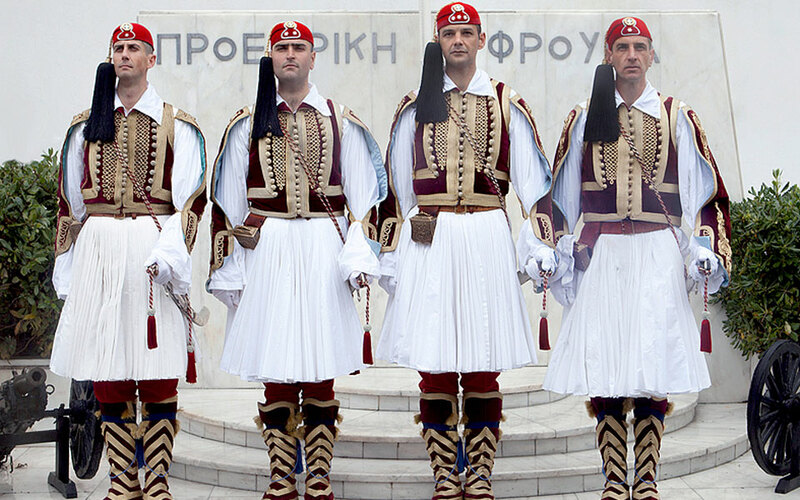 What I learnt is that there is a very great respect for the symbols of Greece, and for their uniforms. Beyond the respect for the symbols, between them they always help each other, and they all work towards a common goal, which is to represent this Greek symbol as perfectly as possible. In their stillness, in their steps, in their stoicism, and that is what characterizes the Evzones. It seems that it moves you. It moved me, it still moves me. Photographing them was an incredible, emotional journey. Because they allowed me to share their experience. The most moving thing, and one I didn’t expect to experience, is that [at my exhibitions] former Evzones of every age approach me and share aspects of their service, even from 20 years ago, 40 years ago; I didn’t expect that. And that is something that I can’t forget, or put behind me. Perhaps I don’t want to and am not ready to, even though it has been many years. But every exhibition brings out new acquaintances new Evzones, and it is something that keeps on giving. Would they ever get tired or complain about the constant shifts? They would beg for one more shift. They wanted one more hour. Of course when it came to the end of their service they would be tired, but the moment that they needed to hand in their clothes, their uniform, that was always a very emotionally-charged moment. And that was because they weren’t just wearing a uniform, they were wearing a part of Greece. And the uniform isn’t just something they wear, it becomes a part of their body. The first thing they looked after was the uniform – to be clean, to be correct. And when it came time to turn in their uniform so that the next recruit could take it, that was very difficult, it was very difficult for them to let go of something that they had served. They have incredible respect for those clothes, incredible respect. 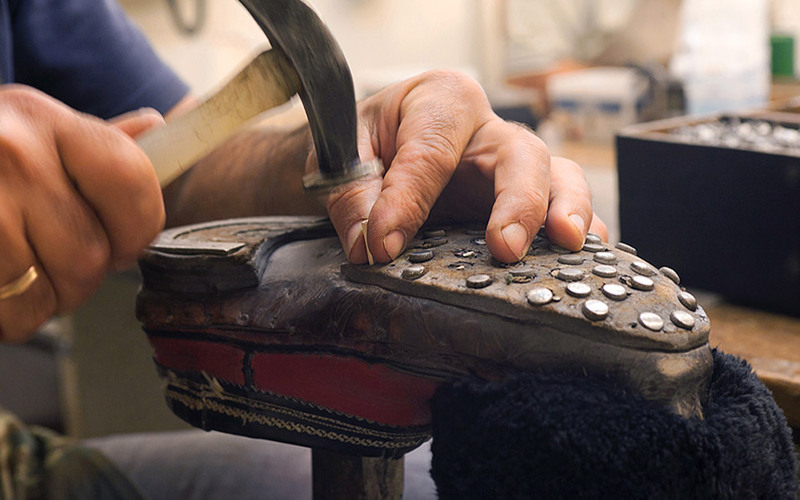 All of the elements of the Evzones' uniforms are made by hand. Each one takes up to 6 months to create. 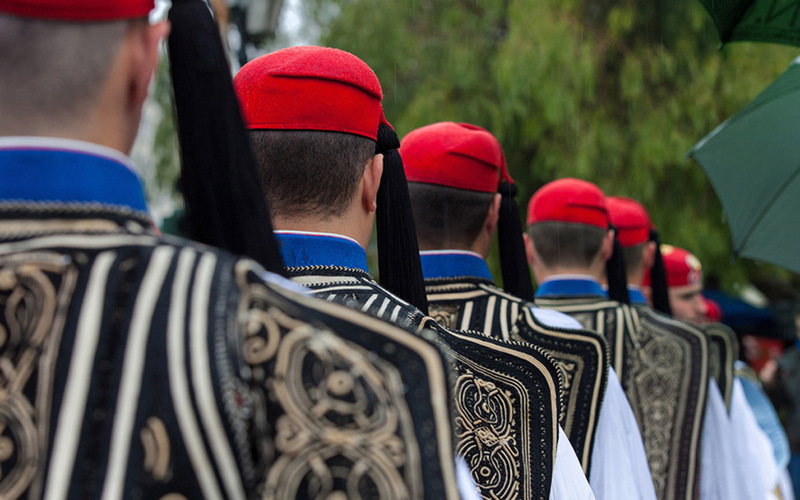 And can you describe the traditional uniform of the Evzones? The red of the fario (fez) symbolizes the blood that was spilt during the fight for independence. And the long tassel represents the tears shed during the war. The fustnella is made up of 30m worth of fabric and once functioned as a form of armor. It has 400 pleats, one for every year of the Ottoman occupation and in front the white and the blue represent the Greek flag. The waistcoat, which is an unwieldy garment, is also full of symbolism. On its back it has folk and religious symbols – the alpha and omega are embroidered, representing Christ, there are crosses, and it also has a symbol representing the infinite. It is all handmade, and each one takes about 6 months to make. Each pair of tsarouchia weighs 3.5 kilos, each one has about 60 nails in the sole – these helped give the fighters purchase on rough terrain. 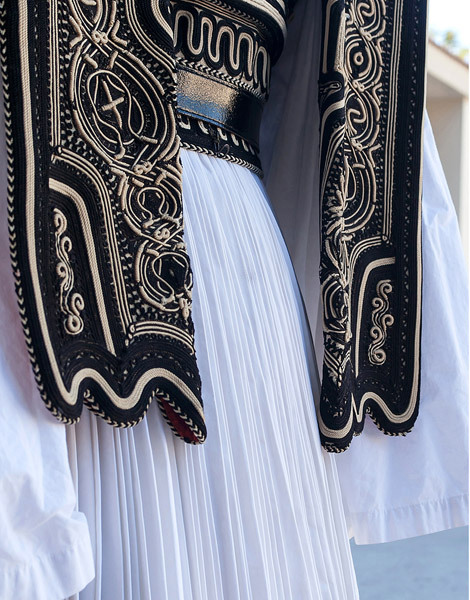 The pompom in front – during campaigns this supposedly kept the foot warm, and it was said that the Evzones hid sharp objects in them in order to use against the enemy. Officers of the Presidential Guard. Their uniform features longer fustanellas and marron and gold on the waistcoat, among other differences. You saw many young men go from being new recruits to completing their service. Did you see any common characteristics in how the experience of serving as Evzones affected them? One characteristic thing they all had in common was that, from the point that they had succeeded in serving in the Presidential Guard, with all that entails, they were confident that they could achieve anything. To deal with any difficulties in their lives – to finish their studies, to find work, to travel abroad. They felt they could handle anything. Why do you think it is important for this institution to exist? What, ultimately is the purpose of the Evzones? Every country has a memorial for those who were lost in war. The Tomb of the Unknown Soldier was inaugurated on March 25 of 1932, and is dedicated to the anonymous soldier who died in battle. The reason that the Evzones exist is to pay respect to those who gave their lives for the country’s freedom. And I will tell you another secret: The reason that the Evzones strike their feet powerfully on the ground, according to tradition, is in order for the dead heroes to hear that the Evzones are still there, standing guard over the memorial. Dimitra Hatziadam (center) poses with Evzones. What are your plans for the future of the exhibition? My goal now is to take the exhibition abroad. That is what I want and am striving for. For those unable to travel to Greece and see the Tomb of the Unknown Soldier or an Evzone themselves, I want to take the mountain to them, as it were, and for them to see and hear – both from me and the audio elements of the exhibition – everything about this institution. Follow Dimitra Hatziadam on Facebook and Instagram.